Design is similar to European Design Cranes with better Features. Drive for all motions ready to fit unit. SEW / NORD German make. Geared brake Motors. Compact unit for Hoisting, CT & LT motions. All gears are hardened & ground with high efficiency, smaller size, low noise, smooth operation, Bearings are life sealed. Overall Crane Weight is less. LT Wheel load is less. All motions are with VVVF Drives. Crane is completely maintenance free. Combined effect is smaller trolley, smaller end carriage. DC Disc Brakes (Fail Safe Type) SEW/NORD/ European make mounted on motors with manual release. Forged C55 Mn75 material suitably hardened assembled in “L” Block Housing are used for Crab trolley and Crane movements. IGUS drag chain is used for CT DSL/ Crab Trolley Power Supply. Open or enclosed type driver’s cabin available. The cabin can be provided either at one end of the bridge girder or center of bridge girder. Moving type cabin fitted with crab can also be provided. Enclosed cabin is well ventilated but air conditioned cabin can also be provided. Standard cabin accessories are operating controllers, ladder from platform. Driver’s seat, cabin, light, exhaust fan Insulated floor matting, fire extinguisher are provided as optional. EOT Cranes are warranted for one year from the date of supply. Electricals warranty is as backed by respective manufacturers. Crab Trolley is made of fabricated structure. Geared Brake Motor SEW / NORD / European make as above are coupled to Rope Drum. Heavy Duty Steel Forged ‘C’ or Ramshorn type hooks as per requirement supported on thrust bearing for free swiveling with safety latch. Hook Block is enclosed in sheet metal enclosure. 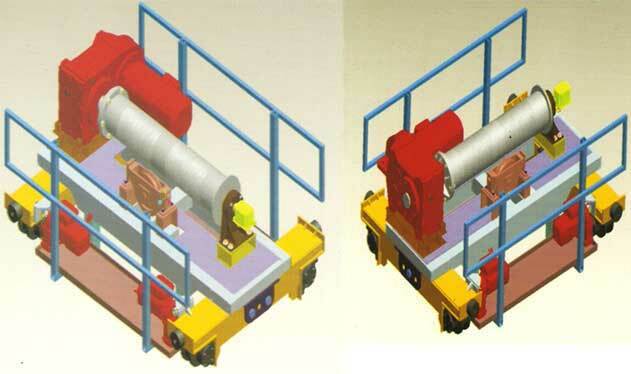 2 Nos Geared Brakes Motor SEW/NORD/European make are used at both end of Crab Trolley. These are mounted directly on CT Wheel driver.